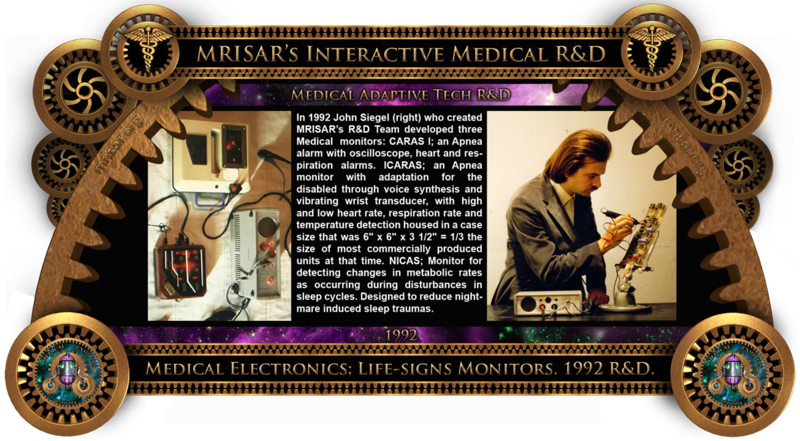 MRISAR's early R&D Medical Life Signs Monitors, all designed and protoyped in 1991. CARAS l; Apnea alarm prototype built in 1991. It has an oscilloscope, heart and respiration alarms. It also has Adaptive Tech accessories for the disabled. NICAS; Monitor for detecting changes in metabolic rates as occurring during disturbances in sleep cycles. It is designed to reduce nightmare induced sleep traumas. Built in 1991. It also has Adaptive Tech accessories for the disabled. ICARAS; Apnea monitor with adaptation for the disabled through voice synthesis and vibrating wrist transducer. Unit features high and low heart rate, respiration rate and temperature detection housed in a case size which is 6" x 6" x 3 1/2". As of 1991 it was 1/3 the size of most commercially produced units. These units can now be the size of a pocket watch. Profit from exhibit sales help to fund our own Philanthropic R&D that has been presented before and/or published and awarded by: the United Nations, NASA-Emhart, Stanford, Cambridge, ICORR, ROMAN, IEEE, Discover Awards, International Federation of Robotics (IFR), etc. Our 1990's circa, original innovative R&D in "Facial Feature Controlled Technology" and "Artificial Sense of Touch Technology" (Adaptive Technology prototypes for the disabled), has helped pioneer those fields! We were the only company in the world to be awarded an entire chapter regarding our work in the International Federation of Robotics (IFR) “World Robotics; Service Robotics, 2011”.